DAWNCHEM of Ohio has chosen Christopher Kane of the Tennant Equipment Company as their “Rep of the Year” 2016. The Ohio based distributor recognizes extra efforts from their key manufacturer partners, including their representatives. The annual award was chosen by DAWNCHEM's management team and sales staff. “Chris has worked diligently throughout the year and helped DAWNCHEM secure tremendous opportunities in the region, and this is his second year in a row achieving the award” stated Ed Rossi its President. 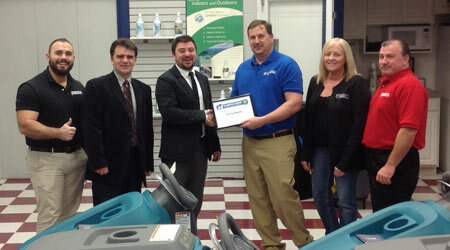 The award was presented to Chris by Bob Mecuri ,Sales Manager of DAWNCHEM. Also in attendance (left to right)was George Newcomb, Account Manager Commercial Marketing Manager for the Tennant Company Dave Lancaster , Janine Thomas, Operations Manager and Jim Whitcomb Regional Sales for DAWNCHEM.